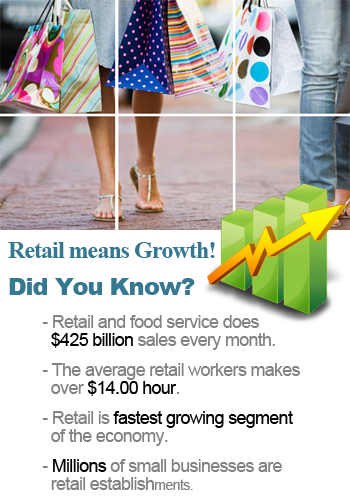 The Retail Network is dedicated to the needs and requirements of Economic Development Councils, Chambers of Commerce and Municipal Business Development Professionals looking to grow their local retail industry. We provide you with up-to-date reports of retail opportunities from every type of retail establishment, from restaurants to hotels, big box retail to small boutique businesses. Not only will you receive a report containing the retailers’ names, addresses and needs, but your report will include the most up-to-date contact persons within the organizations to contact. Having the right contact is the most important part to any effort to reach out and draw a business into your community. Because we know that you are busy, you aren’t asked to learn a whole new system. Your send your report requests via email or telephone to our Retail Network Qualifications Specialists and they will generate the report for you. No complicated databases to manage, no new programs to master… and no limit to the number of requests that you can make to them. Join us today and bring your community its share of the service industry boom! Contact us for a sample report that explains what is on the report and how you can use it. Got Questions? Chat or Call us now!